3- 6″ of light weight growing medium. ideal for large flat-roof buildings and apartments. suitable for low-sloped residential roofs and retrofits. desert grasses and succulent plants. after one year, they do not require watering. annual spring weeding of tree seedlings & weeds – brought in by birds and wind. 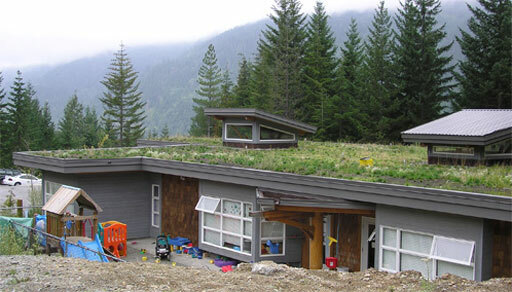 Whistler Daycare Centre: Extensive green roofs are ideal for schools, industrial parks, large big-box stores and multi-family housing. 8-12 inches, or more, of growing medium. require regular maintenance -similar to an at-grade garden. diverse plants and trees can be planted (avoid plants with invasive root systems). Semi-intensive roofs, combinations of both extensive and intensive green roofs, are typically adopted to harness both the environmental benefits of a green roof, as well as a diverse garden within a manageable maintenance budget. 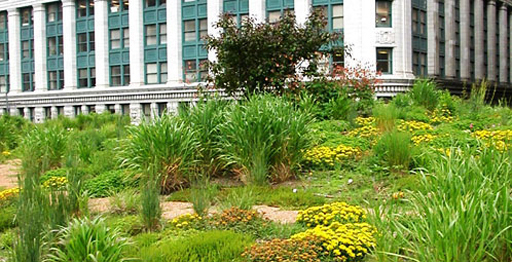 Chicago City Hall: Light weight soils at 4, 6 and 18 inches in depth. 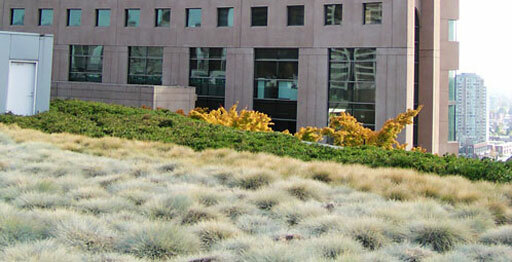 Vancouver Public Library: Semi-intensive green roofs are ideal for long-term care facilities, daycare play spaces, employee picnic areas, and urban agriculture.